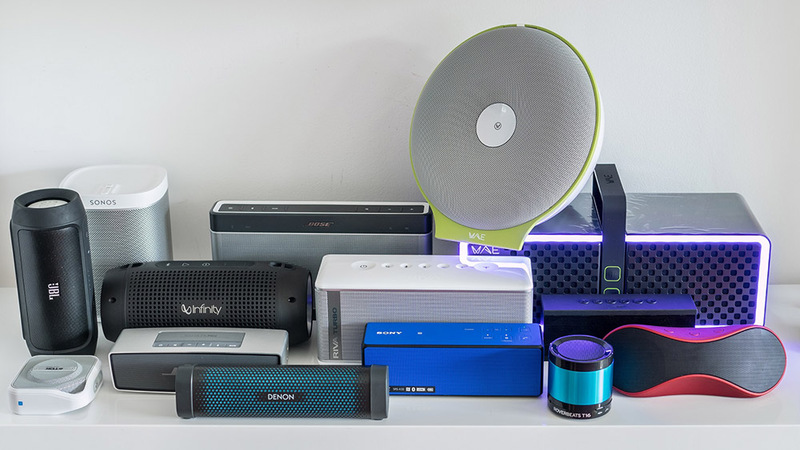 With this list I want to show you my personal favorite portable speakers that I use on a regular basis including some explanation why I have chosen them over some others and when I use this instead of that. It's been quite a long time I wanted to prepare a kind of best-of list of all portable speakers I know or that I have heard. But after having heard so many, I thought that a real best-of is simply not doable as each speaker has its own strengths or weaknesses. After all those years it seemed I would still not be able to find a single speaker which would satisfy all my needs not until I have heard the new Denon Envaya Mini, which mixed up my whole perspective and made my whole list until now pretty useless. The Denon Envaya Mini finally persuaded me to sell all other speakers I currently own, including JBL Charge 2, Fugoo, Sony SRS-X3 etc. Therefore I would like to present *drum roll* the Denon Envaya Mini as my current favorite portable speaker. As it had already taken me some time to prepare this whole list, I will nevertheless add all the other speakers below, although I probably wouldn't consider them at all anymore. Please let me clarify that my main goal is high audio quality. Most will have probably noticed that I have a weekness for a full-bodied sound. There must be at least some base for the music with enough bass to make it sound satisfying, otherwise I cannot enjoy music and prefer not to listen at all. I don't care about speakers that can play screamingly loud but fail completely at lower levels, or speakers with tons of nice features that only sound like my old clock radio. I doubt there is any better sounding speaker available that small right now, therefore the Denon Envaya Mini gets my first vote to become the overall "winner". It is extremely portable, splash water resistant and has a professionally close to hifi tuned sound. It is not the loudest speaker nor the one with the biggest bass, but it sounds as close to flat as possible at that size with full bass response down to 80hz which appears even deeper thanks to some psychoacoustic algorithms. There is some stereo separation and the Envaya Mini sounds perfect at low and at highest levels with hardly any distortion or dynamics compression at all. It should satisfy 70% of most needs, just if you need higher loudness, you will probably wish for something more powerful, this is where my Infinity One jumps in, which you can find next in this list below. Another alternative to the Envaya Mini would be the the JBL Charge 2. Until I heard the Denon, JBL Charge 2 might have been close to a "near-perfect" portable speaker, but unfortunately JBL managed to screw it up making it unsable at low levels and unlistenable with many tracks because they cause noticeable distortion, otherwise the JBL Charge 2 would probably be the best sounding speaker in its class that I would recommend over all the others more or less on par or above the Denon. I feel still so sorry about all the issues it suffers from, and that JBL doesn't really care to offer any fix. It seems they just recently started to sell a new batch of devices, which don't suffer from any distortion, although they still seem to have some issues at lower levels. Apart from that I also hate the status tones the JBL Charge 2 will play if you turn it on, or when it will connect to a device. The tones are so annoying that you cannot even turn it on in a silent enviroment. The JBL Charge 2 is not usable at low levels, it will sound just poor with bass sounding strange and with additional artefacts noticeable during the first 4-5 volume steps. I usually welcome a mirrored volume control between speaker and device, but in case of the JBL Charge 2 the volume steps are very rough and the speaker becomes too loud too quickly. The JBL Charge 2 has pretty non directional treble response. It still sounds quite good from above or from the side unlike most other similar speakers. I also like the fact that the JBL Charge 2 will retain more bass and sound more dynamic than most other competing models. Even at maximum volume you will be able to hear every drum-kick attack, while the Bose Soundlink Mini or the Sony SRS-X3 will compress them away. Sometimes I would prefer it even louder, especially outdoors, that's why I finally settled for an Infinity One described below. Other speakers in this smaller class worth having a deeper look: I really liked the Fugoo a lot as an all around speaker but also for use at home from room to room etc. It might not be a very loud speaker and bass could take some stronger punch, but it is small enough to be carried around and thanks to its "jackets" is rugged to be just tossed inside some bag or stuffed inside a jacket pocket without any additional protection or pouch needed. Unfortunately none of the jackets does have any clip-on option without the additional mount-pack. It would have been great if Fugoo had included some simple lug in any of the jackets, so that the speaker could be quickly clipped on somewhere. The Fugoo is also one of the few speakers that really withstands a complete submerge under water, it is not just splash resistant like many others, but entirely waterproof. 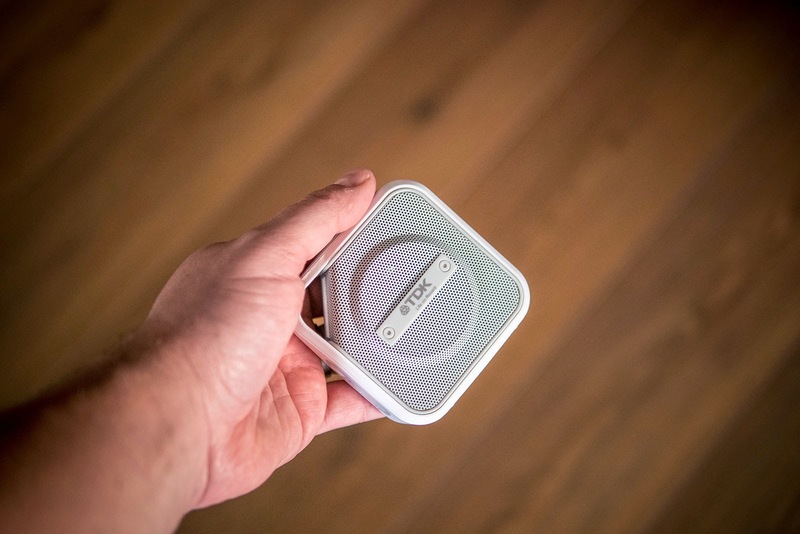 Bluetooth connectivity is great and the Fugoo connects automatically to any found device unlike most other speakers, which seem to be still waiting for the latest one. I also like the fact that the Fugoo remains nearly silent during operation if all voice prompts are disabled. Overall the sound of the Fugoo is quite full-bodied, it is not overly bloated but pleasant to listen to, with a similar bass-amount to many larger speakers like Soundblaster Roar etc, although the sound starts falling apart a little bit above half volume which is not very loud and does not come close to the sound of the Denon Envaya Mini, which is much more serious, and much louder at the same time. If the Fugoo was slightly louder overall with slightly more bass, it would be definitely on my top list if I had to pick just one single speaker, but now the Denon Envaya Mini took this honour and the Fugoo has to go. Another strong contender loved by ones, hated by others is the Bose Soundlink Mini which has no problems like the JBL Charge 2, but I found the sound to be too muffled and too directional and sometimes too boomy. The Sony SRS-X3 might be another worthy alternative and I think it sounds best for low volume listening, especially because you can fine-tune the final bass amount with the input-volume of your streaming device, a welcome side effect of the dynamic sound-processing, which becomes confused with lower input levels and dials bass back, because the speaker output needs to be raised. The X3 has some problems at higher volume levels though and battery life is not as stable, especially when cranked. Unfortunately both Sony and Bose play some kind of annoying tones if they are either turned on/off or if they establish a Bluetooth connection. Another alternative might be the Bose Soundlink Colour. The sound is not as mature or not as refined as of all the others, but it is nevertheless a pretty solid speaker with a nicely tuned sound for all volume levels. It will sound good at low and at high levels, without any side-effects or artefacts. Treble is less directional than that from the Soundlink Mini and the Soundlink Colour will not sound that boomy in most cases although mid-bass has quite an obvious boost with some stronger resonance, which can start sounding annyoing with some particular tracks. Also Bluetooth connectivity is one of the best I had experienced so far with automatic reconnection to 2 previous devices after power on, just don't expect any stereo sound as the Soundlink Colour is rather a stereo speaker with mono sound. Still only available from amazon.com, funnily the Infinity One does not sound really that much better than the Denon Envaya Mini, the Infinity One's sound is just more powerful, which is not surprising given the size being 3 times as large. the Infinity One is basically a blown up JBL Charge 2. The sound is similar between both, with the Infinity One just sounding more blown up. The Infinity One is a bit too large and heavy to be carried around whole the time. 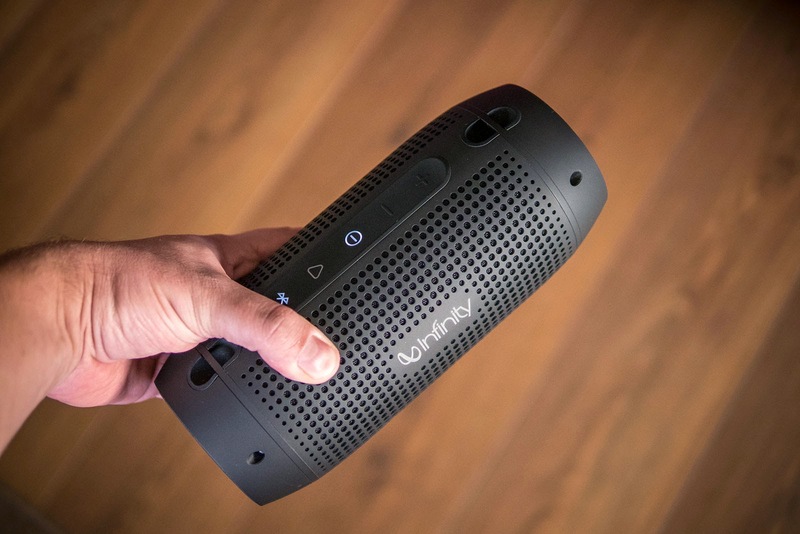 But if you know that you will need a portable speaker which manages to deliver enough power at higher levels too, the Infinity One might be the best choice. When the Denon Envaya Mini is already at its top volume, resulting in some heavy bass-loss, although perfectly usable without any distortion, the Infinity One will still have enough headroom, although the Infinity One will suffer from some intermodulation distortion at these higher settings, but the Infinity One will be able to keep much more bass at comparable loudness settings and maximum volume should still be loud enough for any smaller outdoor event. The stronger intermodulation distortion at high levels is the biggest letdown of the Infinity One, it sounds more enforced than the Soundlink III and many bass-heavy tracks may start sounding really harsh because of this, while others might still sound perfect, Infinity should have added some simple tweeters to the front drivers, as the back drivers sound pretty clear as they are fitered for higher frequencies, where intermodlation becomes most obvious. Similar to the JBL Charge 2 the Infinity One will also manage to retain the dynamics of kickdrum attacks, unlike the Soundlink III, which will rather iron out any stronger punches. For house-music I would prefer the Infinity One over the Soundlink III, which might be better for Jazz and acoustic stuff due to less intermodulation distortion problems. Unfortunately the Infinity One has the same loud status tones and the same mirrored volume control with even rougher steps than the JBL Charge. In case of an iOS device the volume control is not fine enough to really allow any sensitive adjustment. Thank godness the Infinity One does not suffer from any of the processing artefacts which plague the JBL Charge 2. I think that the Infinity One delivers the best performance of all speakers I have tested in this larger speaker-class aroung 1kg, including Bose Soundlink III, Beats Pill XL, TDK A34, Loewe Speaker2go and even the B&O Beoplay A2, which has its own qualities and problems, thus as total package I just regard the Infinity One as the best option right now. A big problem for all non U.S citicens might be that the Infinity One is only offered in the U.S so you will have to import it on your own if you live outside, which is what I finally did. But for casual listening at home I prefer the Denon most of the time, even though it has slightly less bass, it sounds more natural with more stereo separation and is much easier to carry around. Other possible alternatives: Bose Soundlink III sounds quite similar to the Infinity One, but has a more directional and more "edgy" sound while the Infinity One sounds rounder and more open. The Infinity One also has the option to be charged through USB in case of need and it can charge external devices too. 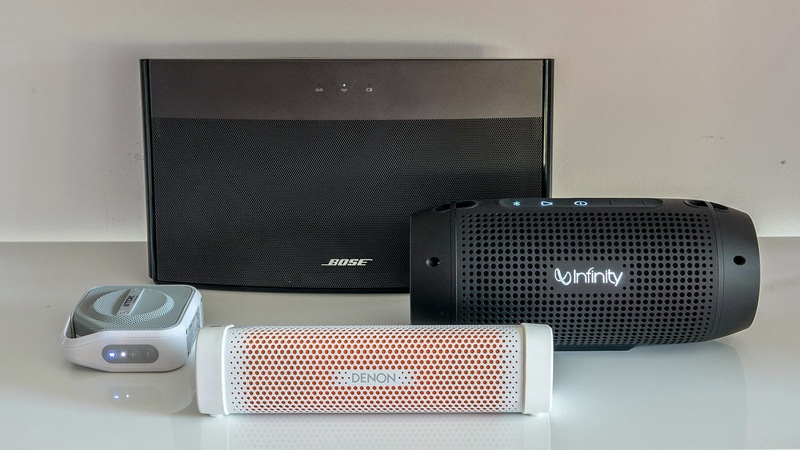 Overall I prefer the Infinity One over the Bose Soundlink III, although the Bose has the better tuning for low levels with a more profound sound and obvious intermodulation distortion should be less of an issue. Other alternatives might be the TDK A33 which is pretty cheap now or the newer A34 as both are pretty balanced sounding speakers unfortunately with a pretty bad battery and a questionable charging logic. I never manged to make the A33 play for longer than 6 hours even at lower levels, the A34 seems to suffer from the same problem. The Soundblaster Roar is very similar to the TDK A33 in sound but has tons of additional features which you might need or not need. It doesn't play as loud as the TDK, but overall it is the better speaker I think. It doesn't sound as full bodied as the Infinity One or the JBL Charge 2, but the sound is still quite nice, although it won't knock your socks off. You might also like the Denon Envaya which sounds quite similar to the Bose Soundlink III although not quite as loud but also cheaper. The B&O Beoplay A2 would have been my personal favorite if battery life was more predictable and the sound more constant on higher levels. I really like the design and sound tuning is simply impressive, but I couldn't live with the added distortion on many tracks especially at the given price being one of the most expensive speakers shown here. I would also like to add the Beats Pill XL, which is not a very good sounding speaker per se, but a very powerful one with great features, wireless stereo pairing etc. It is still one of the loudest I have heard at this size and manages to sound pretty controlled when the others are already struggling or reaching their limits with the Pill XL still being much louder than all of them. Although I currently don't use it that much, I still think that this old and discontinued Bose system is a spectacular and underrated portable Bluetooth speaker. It is based on the Bose Sounddock portable which was also discontinued in the meantime but with Bluetooth instead of the Apple-dock. Thanks to its flat design it is still pretty portable despite being larger than the Infinity One and with just 2kg including the swappable battery it should find its place inside any even smaller rucksack. The Bose Soundlink Wireless Music System is one of the most powerful systems at this size. The amplifier delivers 40Watts (unlike the 25W of the Infinity One), and thanks to Bose's DSP processing they manage to push the loudness level quite above the limits of what the 2 fullrange drivers are able to handle by applying some stronger dynamics compression and dialing bass back. Although there is some stronger distortion at maximum volume the Soundlink Wireless Music System nevertheless manages to fill a large outdoor area with sound if you don't want to carry any larger boombox with you. It sounds very full bodied with the deepest reaching bass although it has a tendency to sound a bit muffled, especially at lower levels and off-axis. A possible alternative might be the IK Multimedia iLoud, which is able to reach a similar loudness, but not without distortion either. Unfortunately the iLoud won't sound that full-bodied at lower levels and the built in battery seems to have some issues not being able to hold a charge after some time of usage according to my friend who had used his quite often. Another interesting speaker might be the Harman Kardon Onyx or the much cheaper Onyx Studio which omits auxiliary input, Airplay and DLNA compared to the expensive version. They sound slightly better and are more powerful than the Bose, but are a bit lacking at lower volumes. They are also larger and not that easily portable with the battery life hardly exceeding 4-5 hours at high volumes. If you need still more power and more loudness, you must have a look at all the larger systems like the Klipsch KMC-3 or some Pioneer Steez units or the JVC Kaboom series etc. But nearly all of them need extra batteries for portable use and will quickly exceed several kilos of weight. Maybe the new Teufel Boomster could do the trick as it has a built in battery which can be even extended by some additional AA-cells. So far I didn't feel the need for such a unit, it is just overkill for home use, I previously had the Altec Lansing IMT800, but didn't use it much because of the size and the hassle with batteries. But my friend loves his KMC-3 and uses it regularly for outdoor parties with friends. I think the TDK A12 (micro Trek) produces quite a balanced sound for being that small. It is not the loudest speaker at this size, but it just sounds "right". There is some upper bass which makes it sound appealing, but the TDK is not able to produce any deeper bass, thus it is not really full-bodied and quite a bit too thin for my own taste, but still better than not having a speaker at all. If you put it flat on some resonating surface, you can boost basst slightly, but the passive radiator doesn't really play anything below 100Hz, so don't expect any miracles like with many other vibrating speakers or like with the FoxL Dash 7 that are tuned much lower, but won't produce any hearable bass until they suddenly sound much more mature depending on the surface they are placed on, as shown in my example video for the FoxL Dash 7. Unfortunately most of the time there are no suitable surfaces around outdoors for enhancing the sound. Therefore the TDK seems to apply some "virtual bass" algorithm. It sounds a bit as if the lower frequencies not reproducable with the tiny driver were subtly added transposed one octave higher (similar to what MaxxBass is doing). The A12 manges to give an even more full-bodied impression than the similar JBL Clip, although bass reaches considerably lower on the JBL Clip, when looking solely at the frequency response measurements. There is also some bass compression going on, maybe a side-effect of the virtual bass algorithm, but when directly compared it is quite noticeable that the TDK does some processing, which is not a bad thing, as any unwanted artefacts are still kept to the minimum. The TDK A12 has no distortion even at maximum volume, but there seems to be some sample variation as I have tested several different units and on many of them the passive radiators started to rattle heavily at higher volume levels with bass heavy tracks, the resonance-frequency seems to be around 125Hz where rattling is strongest. Because of the single passive radiator at the back side the TDK A12 also has a tendency to vibrate or even creep around when put on certain surfaces. If you attach the included carabiner, this may rattle against the body at higher loudness-levels, that's the drawback of single passive radiator designs. Battery life is somewhat short, especially at high volume. A nice feature is that you can pair 2 of them for true wireless stereo, in fact I have 2 of them and both cost me less than 60€. Strangely stereo pairing doesn't work that well sometimes. I am not sure if this is the speaker's fault, or if the Bluetooth connection of the iPhone is too blame here, but sometimes when in wireless stereo mode the audio quality is reduced considerably resulting in a sound which resembles that of a lower bitrate mp3-file. Sometimes only one will play, although both confirmed the connection. I have not found any regularity, but in case they behave unexpectedly, I have to go through the entire pairing process again to get rid of it. Other similar speakers to consider: JBL Clip produces a similar overall sound but can play quite a bit louder. The JBL Clip can be daisy chained with another one with its built-in wire and it has speaker phone included. Due to its rounded design it is easier to put inside a pocket and the carabiner is already built in unlike with the TDK A12, which has the carabiner separate. The battery life of the JBL Clip seems to be even shorter than that of the TDK A12 though, but due to the included bassreflex port instead of the passive radiator the JBL Clip won't vibrate even at highest loudness levels. 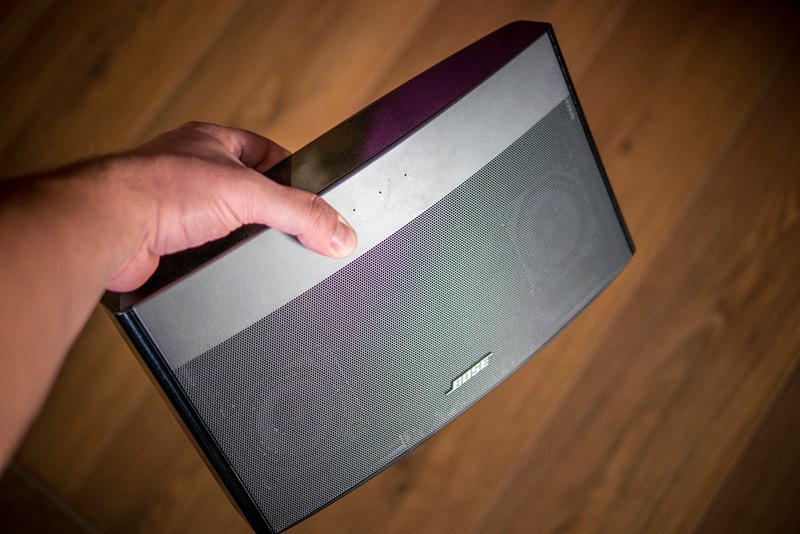 I would regard the Mini Jambox as another alternative, although nothing special it is still able to deliver quite a solid sound and will also sound rounder and more full-bodied than both the TDK and JBL, although the maximum possible volume is quite limited. I have yet to find any better sounding speaker that small. Most of them might be louder for sure, but they just don't sound good at normal listening levels. Of course I welcome any other tips! 3 years ago it was still unheard of a beverage can-sized speaker that it would be able to produce any bass down to 60Hz. After the Soundlink Mini which was pretty unique at the time of its release there are meanwhile some other alternatives available. 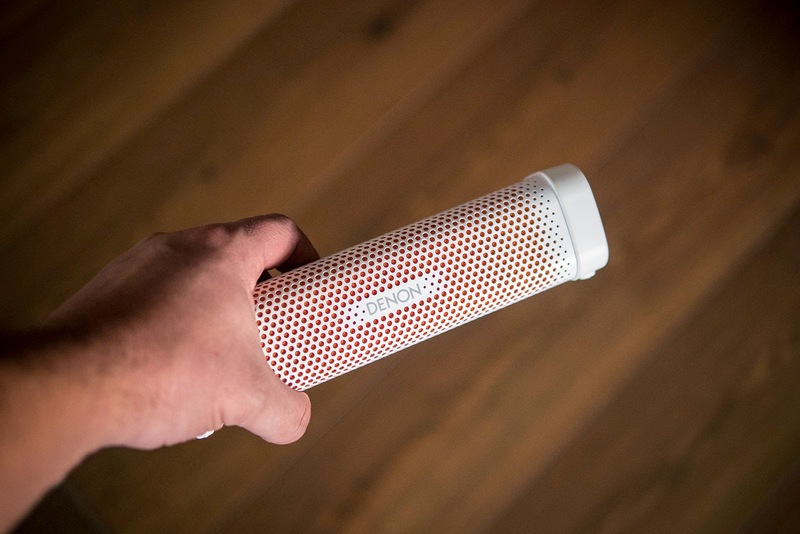 The portable speaker market is evolving pretty quickly. So please just take this personal list as some temporary snapshot which may suddenly turn around with any new speaker released, just like it did, when I heard the Devnon Envaya Mini. There are some interesting speakers on the horizon like the electrostatic BenQ treVolo (formerly known as eVolo) or the Massfidelity Core, there is also some rumor about an upcoming larger and more powerful speaker from Fugoo, but I am not sure if I will be able to receive any of those units for a review. As soon as I can get my hands onto something interesting I will let you know. i had already contacted mass fidelity some time ago, but so far haven't got any promise for a review unit. How does your Envaya mini compare to the UE Boom. Do you think it's better? The UE boom is a clock radio, any speaker is better! I'm thinking of getting the Infinity One, but waiting until the price drops again (in the US it was $250 for a while but now is back up to $300). I have both the Peachtree Deepblue and now the Deepblue2, but I don't have a good portable speaker option. I have an Ecogear water proof speaker, but the sound is just midrange and I keep it in the shower. I keep going back and forth between the JBL Charge 2 and Infinity One, and at the current prices the JBL is the better value, but I want the fuller sound so I'll wait. Thanks for pointing out the new Megaboom, seems Wired have taken off their review again. Haven't found any cached version though, have you? If they did it right this could be a killer speaker, maybe even better than the Infinity One which is not that special to tell the truth. I think I even prefer the sound of the Charge 2 now that they fixed most issues on the new units, the Infinity One doesn't sound that much more fuller just more blown up but bass is equally powerful on the much smaller JBL. The Infinity One struggles a lot with intermodulation distortion which more and more is killing it for me. Some tracks become already dirty at half volume, where the JBL still sounds perfectly clean. Woops. It appears that I deleted my comment. Anyways, there are now several reviews of the UE Megaboom, as many were released today. CNET gave it 4 stars, which is no surprise because they give nearly every decent BT speaker 4 stars. The consensus from the reviews are that the Megaboom is an upscaled UE Boom that is incrementally improved all around, but more or less the same design. Notably it is now waterproof - submersible to the IPX7 standard, as opposed to the IPX4 standard of the UE Boom. Despite the vague reviews commenting on the better bass and fuller sound, I am very curious on how it actually sounds. Bascially, the reviews are what you'd expect, which provides little information on the sound specific enough to be truly helpful. Thanks for the comments on the JBL Charge 2 and Infinity One. Perhaps the Charge 2 will suite my needs more. No battery powered option will come close to the Peachtree Deepblue and Deepblue2, so portability, convenience, and reasonable sound should be prioritized, I should probably get the Charge 2 and keep the $$. It seems my Megaboom was already shipped so I will hopefully be able to give a first impression of it soon. yes i sold mine with hardly any loss in value even after one year of usage. that's the good thing about bose! Do you plan to have both. no the big envaya was just a loan, altough i like its deeper bass treble roll-off is too strong already above 10khz together with the stronger boosted bass this results in an unbalanced boomy sound. the mini is much smaller and much better portable and delivers a more impressive overall performance. The "big" envaya has reduced price from £170 to £120 in the UK. Being just £20 more expensive, would you still recommend the mini? My priorities, from greater to smaller, are sound quality, power, portability. Thanks! I am wondering the same thing as the guy above! Torn between Envaya Mini and the bigger one, since the price difference is almost none. Hi, I'm the "guy above". Not sure if you will read this but I finally opted for the mini, despite the price being almost the same. The sound quality is amazing, I personally prefer it over the orignial envaya, even though the original is louder. I would only recommend the original envaya if loudness is your priority. This doesn't mean the mini isn't powerful, at full volume my neighbours would complain! The new JBL charge 2 units have all distortion issues fixed it is just at low levels that still some processing flaws remain. You could try the new UE Megaboom, looks like a very interesting speaker and a serious contender for the Infinity One which I would regard as best in class, hopefully I will be able to listen to the Megaboom soon. There is also the upcoming Fugoo XL, which seems like another promising higher end rugged option. sure and i am already waiting for a definite answer from Fugoo about a review sample. but the Fugoo XL is really big and i think 2kg already. I read your stuff and listen to your videos... THANK YOU for them. Your reviews and tests fill a white spot in this sales-centered world and are the most useful I have ever read about audio units (and I have read many of them). You made for many people (like me) choosing the portable audio unit a pleasant and "I know what I am buying" experience. Fully agree to what F.Tib wrote. Thank you for your reviews! During the last few weeks I have bought and tested the Fugoo, UE Megaboom and finally Denon Envaya Mini. Have to agree with Oluv that the Envaya Mini offers the best overall price/quality ratio and, most important, best sound. The Fugoo sounds pretty good on lower volume levels but isn't able to get loud enough. I could sit at 0,5 m distance with max volume and listen to it for a few hours while working on my laptop. Sound was still ok, with no real noticable distortions, but what if I would want to use the speaker for a small party or outdoors? Therefore I decided I wanted to try the new UE Megaboom, which was already announced but wasn't in stock when I ordered the Fugoo. Fortunately it was available a week after I bought the Fugoo, so I ordered one and compared both. As long as you crank up the UE Megaboom to higher volume levels it is quite impressive, compared to the Fugoo. It has got slightly more bass, thus offering a fuller sound. However, when you listen to it at a more moderate volume it sounds thin, especially lacking in bass. I was looking for a speaker that could handle all possible situations and therefore needs good sound quality but also some ruggedness and some serious volume levels. Since I had to make a decision whether I would keep the Fugoo, I decided not to do so, since it lacks in volume too much. Because of all the other (very) good specs (30m Bluetooth Range, max of 20 hours battery, OTA updates, Bluetooth Smart, IPX7), I wasn't sure if I would send back or keep the UE Megaboom. I believe for €299,- one should be able to by a Bluetooth speaker that meets all personal requirements. Since it didn't met my requirements in sound quality (espacially moderate levels) I kept browsing the internet and stumbled upon this site. I read Oluv's round up of this year's best Bluetooth speakers and his clear preference for the Denon Envaya Mini. So I bought one of those as well and compared it to the Megaboom. At almost all volume levels the Denon is the better choice. Only when cranked up to (extremely) high volumes, the Megaboom performs better, with a bit more punch in the bass. However, the Denon is able to deliver some serious loudness as well. Definitely good enough to provide a small party of some tunes. When it comes to other specifications the UE Megaboom has got some advantages compared to the Denon, but none to decide in favor of the Megaboom. - Battery life: 20h (Megaboom) vs 10h (Denon). I solve it by using a powerbank when necessary. - Ruggedness: IPX7 (Megaboom) vs IPX4 (Denon). I ommit this by not throwing my speaker in water. - Bluetooth range: 30m (Megaboom) vs 10m (Denon). When i'm playing music, I'm near the speaker ans so will my phone. - aptX: No (megaboom) vs Yes (Denon). With aptX you can use the blutooth connection while watching a movie without lipsync issues. Also skipping songs seems to work more smoothly with aptX. I can't really tell if the sound quality is better with or without aptX. All in all I decided that for €99,- (vs €299!) the Denon Envaya delivers the best 'bang for your bucks' so I decided to keep that as my main bluetooth speaker. Thanks for the reviews, Oluv! Hope you can keep up the good work. Although for the Denon doesn't really give a reason to keep searching, I am going to keep an eye on the bluetooth speaker market. Primarily to see if there will be a larger speaker with a lot more loudness and bass (more then the Megaboom, which doesn't boom very mega). This would become my outdoor party speaker.Hopefully Fugoo will deliver you a test sample of the Fugoo XL. I liked the Fugoo very much in terms of build and sound quility as well as the ruggedness and battery life. The biggest drawback was the (weak) loudness, but that should be better with the XL (6 watts vs 24 watts). Have you thought of trying the RIVA TURBO X for a loud speaker with great battery to boot? First of all, allow me to thank you for your clear and precise review. I need your help. I've spent a lot time reading many reviews about portable speakers but I'm still not 100% sure which to go for. You see, in a few months, I'm starting a world trip using a bicycle. I need a speaker which I can set in front of my bike, that can provide entertainment on some of the 40k km journey ahead of me. Currently it's a toss up between jbl charge 2, ue megaboom (although this will cost substantially more), Sony SRI - 5 and now denon envaya (since reading your review). Could you use your expert knowledge of portable speakers to recommend me a speaker that I can take with me on the road? for such a task i would rather suggest the Fugoo. It is not extremely loud, but it still sounds better than most and the battery life is outstanding. if you can mount it directly at the handle-bar it will be loud enough for sure. otherwise i would suggest the JBL charge 2 despite not being weather proof, but it sounds better than most of the others, and although I personally prefer the Denon Envaya Mini, the JBL charge 2 has a much better battery which should also reach close to 20 hours at half volume, while the Denon will rather play for 6-7 hours only. I picked up a second A12 on sale. Tried the True Wireless Stereo mode, and while it does play in stereo, the sound only gets as loud as it would if it was one speaker. Is this true for you as well? In other words, it gives you true stereo, but it doesn't give you double the amplification. no, of course 2 won't give you double the loudness, you would probably need 10 to get double SPL. but 2 will definitely play louder than a single one, i think about 2dB which is not much though and far from double! There is much better than Bose. Try Klipsch kmc1 and Loewe 2go. These Bluetooth Speakers have details and more power and are realy lovely on acustic musik. But for the price Minx is the best. The other cost twice. Listen to your ears and find out for your self. But still I havent try some odd speakers yet. This is because of the way that they are without limitation and can enable one to chip away at a ... In this specific area, Bluetooth shower speakers have sealed past.